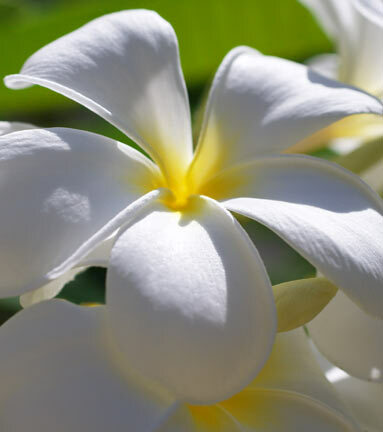 A medium to large flowering frangipani (flowers up to 10cm diameter) and wonderfully fragrant. During the warmer months the flowers are borne in showy, terminal clusters. These last well as cut flowers. This tree has become naturalised in India where it is used extensively in temples as it symbolises immortality. A tough pot plant or feature tree. Note: The milky sap may cause mild stomach upset if ingested. Grow in moderately fertile, well-drained soil in full sun. The Frangipani grows best in warm, moist regions, but it can also be grown in cooler, drier areas (e.g. in full sun near a north facing brick wall, sheltered from cold winds). Water it occasionally in summer if you live in the winter-rainfall regions or drier summer-rainfall regions. Frangipanis loose their leaves when stressed or during cool weather and reshoot when conditions are better. Salt tolerant.